In a major renegotiation of a long term gas purchase agreement with Qatar sealed on Thursday, India has effected foreign exchange saving on import of upto Rs.16,000 crore ($2.5 billion) , Petroleum Minister Dharmendra Pradhan said here on Thursday. “The year has been memorable for India’s oil and gas sector also for the signing of this modified agreement. 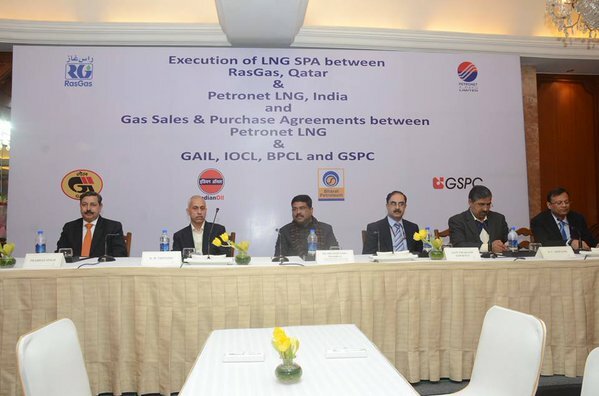 Going by the old long-term gas contract price, we have succeeded in renegotiating a benefit of Rs.16,000 crore in this calendar year,” Pradhan said in his address here at the signing of the modification to the gas sale-purchase agreement between India’s Petronet LNG and Ras Gas of Qatar. “From the $12-13 per unit that we need to pay now under the long-term contract, we have brought the price bandwidth down to $6-7. The deal will help Indian LNG consumers save Rs.4,000 crore annually,” the minister said. “We are grateful to Qatar for being a good partner,” he added. RasGas and Petronet signed a revised LNG sale-purchase agreement on Thursday, whereby Qatar’s state-owned natural gas producer will sell the fuel at nearly half the original cost. The new contract is effective from January 1, 2016 and ends in 2028. In addition, RasGas has also agreed to waive off the “take or pay” penalty of nearly Rs.12,000 crore on Petronet for a lower offtake during 2015. In return for the renegotiation, Qatar’s RasGas will be selling an additional one million tonnes of LNG annually to Petronet. “The economy of the world is changing and in this regard India did not want to lose out in the changed dynamics. We want to move towards a gas-based economy. For this a restructuring of the long-term contract with Qatar’s RasGas was required,” Pradhan said. He said the importance of renegotiating the contract was discussed at the highest level when the Emir of Qatar Sheikh Tamim bin Hamad Al Thani met Prime Minister Narendra Modi in April 2015 in India. “I went to Qatar in November to put our points there. Qatar has been a good business friend, but we’re now moving from the relationship of a buyer and a seller to long term partners,” he said.